“The war for survival of the planet Lusitania will be fought in the hearts of a child named Gloriously Bright. On Lusitania, Ender found a world where humans and pequininos and the Hive Queen could all live together; where three very different intelligent species could find common ground at last. Or so he thought. Each time I return to the Ender Quintet series I’m filled with excited anticipation. Will this next installment live up to the extremely high standards set by the previous books? Or will it lack the qualities that never fail to captivate me? Fortunately, so far I have yet to see the latter concern be the case. 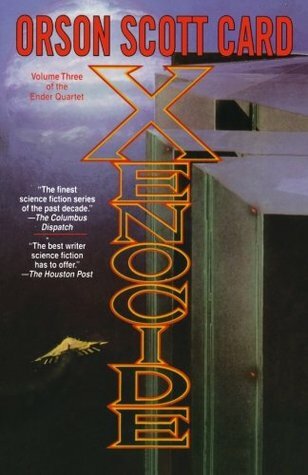 Xenocide, the third novel in the Ender Quintet series, is a fascinating, gripping story of alien species, space travel, and the fight between common people and government institutions. One of my favorite things about this book is the mix of scientific theory, philosophy, and moral dilemmas that are incorporated into this story (and the entire series, really). For example, the characters in this novel struggle with the question of whether to destroy the harmful descolada virus that has been hurting human life on the planet colony Lusitania. In doing so, they would also be committing xenocide (wiping out an entire species) because the pequininos (another alien species on the planet) require the descolada virus in their bodies in order to live. These issues are complex and have no obvious correct answer, making them endlessly interesting to read about. Moreover, Orson Scott Card creates characters that have an astonishing depth to the personalities. Mir becomes a changed man throughout this book, being forced to deal with the struggles of becoming crippled. Ender is as wise and conflicted as ever, haunted by his childhood, his brother Peter, and the controversial acts of war he has committed in the past. Valentine has to constantly choose between staying loyal to her husband and children or staying loyal to her brother, Ender. Jane has to identify exactly what she is and come to terms with the immense amount of power she has and the danger she inevitably is in. Nearly every character undergoes significant development or transformation, both good and bad. The planet of Path is introduced in this book, as is the idea of the conflict of the Godspoken (people who the gods choose to communicate with) v. the common people. The uncovered theory behind why there is a distinction between the Godspoken and normal people on Path is a clever twist that I never saw coming. It completely makes sense, however, which is another thing I love about this book and series as a whole: Orson Scott Card creates these unique worlds and conditions, and then justifies and explains them with scientific theories that seem logical and understandable to the common reader. Whether or not these scientific theories are viable is a completely different discussion, but they nevertheless add a fascinating and thought-provoking element to this series. Orson Scott Card’s novels are some of the most detailed, original, complex, and interesting books I have ever read. Overall, I thought this book was fantastic. It was detailed yet gripping, scientific yet fairly easy to understand, and long yet never boring or dull. I highly recommend this series to anyone who is interested in science fiction or thought-provoking books in general. Although, I think you should probably read the books in order because otherwise you’ll most likely be very confused. I don’t know many people who have read these novels, but I would love to see them grow in popularity! Have you ever read any books in this series or anything by Orson Scott Card? What did you think of it? Let me know in the comments section below! I had fun reading this series. It has been a while but I really loved the mix of humanity, technology, and alien survival rights. I am glad to see you enjoyed them as well! Wow. Well, you’ve definitely sold me on the series. Thanks!